Lambeth Cyclists' Clare Neely comments on this week's Waterloo Roundabout consultation response report. She says the report makes frustrating and occasionally entertaining reading. TfL proposed a "peninsularisation" scheme where a some of a roundabout is closed to traffic so the roundabout is converted from being like an island to a peninsula. However, similar "penisularisation" schemes south of Westminster Bridge and at Elephant & Castle are difficult to follow. Those schemes feel slightly safer for someone like me, who has cycled in London for nearly 60 years. I cannot imagine anyone who is new to cycling will find the Waterloo proposals the reason to get on a bike. As our Lambeth Cyclists response points out, getting onto the junction involves cycling across a busy bus lane and if you are heading over the river you still have to cycle with buses. 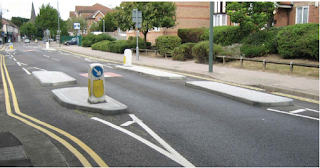 Why is the banned turn still in the scheme, despite widespread objection? According to the report "This is due to the prohibitive cost associated with further carriageway widening". Or put another way, the amount of reduction in current motor vehicle traffic road capacity, is too scary for us at TfL to contemplate, even though most of those motor vehicle journeys could be walked or cycled. We, the report writers, know that in another part of TfL there is research that concludes that good cycle facilities reduce congestion, but we don't really believe them. In the report there is the requirement, in all seriousness, "to keep traffic moving through the area to reduce pollution". Cycling is "traffic" and the way you reduce pollution is to reduce the amount of "motor vehicle" traffic using London's roads. There are two ways of doing this, reallocating space to cycling, for instance by installing with flow cycle tracks, and removing rat runs, or charging people to drive and park. Hysterical responses from people who drive, suggests the scheme is a move in the right direction on reallocation of road space to people cycling. Other good news from the report is that local people are very concerned about an increase in rat running, so may support filtering out through motor vehicle traffic with a knock on effect of more pleasant walking and cycling away from the junction. Cycle campaigners were right all those years ago, I would put money on us being right again, that is the scheme is a step in the right direction for encouraging cycling, but seriously flawed. That report would have taken a lot less time to read. Read more on TfL's Waterloo consultation. Plans included in some consultations are better than others. Help us make them better. Join our online discussion on the Lambeth Cyclists email group. Let others know what's going on in your part of the borough and help inform Lambeth Cyclists' response to consultations. Support for two-way cycling on one-way roads. Visit and sign up to the Lambeth Cyclists email group. 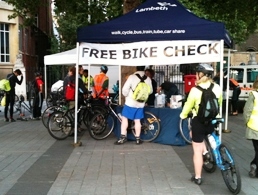 Lambeth Council’s free Dr Bike events run every other Wednesday evening through the winter. Dr Bike will look at your brakes, tyres, gears and the general road-worthiness of your bike. The Dr Bike mechanics will fix any problems if it's possible to do it there and then. Otherwise they will tell you what is wrong so you can take your bike to a bike shop and explain the problem. 10 January – Kennington Triangle, opposite Oval tube. Our next Architecture Ride will be on Saturday 30 September and will be the second episode of our exploration of the many and dazzling things that can done with an often maligned building material - Concrete! Following last year's Concrete One ride in West and North London, we are now running Concrete Two, visiting some concrete delights of South London and the City. While concrete is often associated with the architecture of the 1960s, and in particular the style known as brutalism, it remains a widely-used building material, employed both for its structural and aesthetic qualities. The ride will include some 60s and 70s 'classics' as well as more recent buildings that make full use of this versatile and varied building material. Meet at the entrance to Stockwell Bus Garage on Lansdowne Way, SW4 at 10.45. The ride, which will be easy-paced and as much as possible on quiet roads, will finish on the South Bank at around 4.00pm, with lunch along the way. Ride led by Tessa Wright and Mark Knox. Enquiries - Mark 07765 945530. TFL has another consultation on plans for Brixton Hill, this time to speed up the traffic turning into both Dumbarton Road and Upper Tulse Hill. Brixton Hill is a major cycle artery with poor conditions for cycling. Plans are described as a ‘vulnerable road users safety scheme’. However, it is clear that the scheme has been designed not to protect or improve conditions for vulnerable road users but to speed up the motor vehicle movements that are causing the danger. Motor vehicle on motor vehicle collisions may be reduced but conditions for people walking or on bikes will be worse. The new plans include the removal of some bus lane. This February TFL’s consultation response on changes to bus lanes on Brixton Hill rejected calls for protected cycling facilities arguing “proposals provide benefits to cyclists with the improved continuity of bus lanes”. By TFL’s own logic removing sections of bus lane will be a dis-benefit to cyclists. On sections of Brixton Hill where bus lanes are not continuous and at times when lanes are not operating vehicles commonly undertake at speed causing significant danger and discomfort for people on bikes. See TFL's plan and email your response to TFL by 13 October. The danger for pedestrians and cyclists comes from the volume of traffic and the speed at which it turns into and out of these side roads. The existing build-outs were installed with the aim of slowing turning traffic to improve pedestrian and cyclist safety. Widening the junction entrances will increase vehicle and worsen conditions for for people walking and cycling. A recent survey of residents by Brixton Hill councillors identified both Dumbarton Road and Tulse Hill Road as having major problems with fast, aggressive, rat-running traffic. The scheme states as a "benefit" that removal of the kerb build out pinch point will ease congestion at the junction. This is likely to increase the volume of traffic using these roads as rat runs and exacerbate already poor conditions on these residential streets. Pinch points were added to nearby New Park Road in 2016 with the explicit aim of increasing congestion and discouraging use, albeit with very limited success. The problem to be addressed is a rat run on residential roads that crosses an A-road causing danger to both motorised traffic and vulnerable road users. The solution to that problem is not to make that rat run easier. The solution is to block it through modal filters either at the junctions or in the streets beyond. Lambeth Cyclists is strongly against the proposed changes which will have a negative impact for people riding bikes. Join the discussion online or by email. Next May's council elections will be here quicker than you might like. With the elections just a few months away it is time to review progress made by your councillors against the 'ward asks' they pledged to support four years ago before being elected. Email your councillors (who? search with your postcode) with your comments and questions on progress during their term in power. This year's Cycle to Work Day is 13 September. Even if you ride to work regularly Cycle to Work Day could help you encourage colleagues to ride to work too or tell your boss to get on their bike your employer to do more to help. The London Cycling Campaign has an advice page with year round top tips. 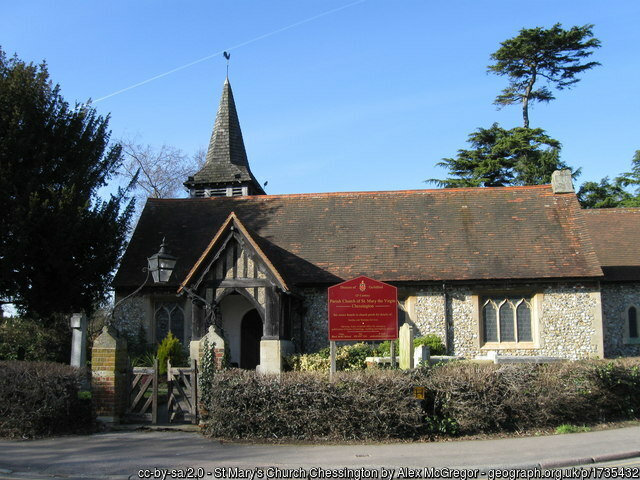 Join us from 7.30pm on Tuesday 15 August for our monthly meeting. 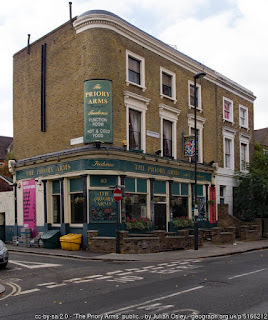 This month we will take an even more informal approach and meet at the Priory Arms in Stockwell instead of our usual venue. This social meeting will enable us to catch up on local cycling issues including the consultations on changes to Lambeth bridge, Waterloo bridge and Nine Elms while recognising that fewer people will be around. The Priory Arms is a pleasant pub on Lansdowne Way, SW8 2PB. There is bicycle parking just outside. 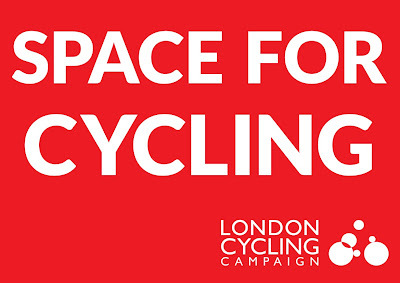 We will have some London Cycling Campaign publications so you can spot us! Walter Segal self build in London. Picture by London Permaculture on Flickr. Meet in Brockwell Park on Saturday 22 July for our next architecture themed ride. With the housing shortage being much in discussion these days, especially in London, it is interesting to learn of an approach to housing that offers one solution - that of 'self-build'. This ride will look at the housing that was built by self-help communities using the building techniques of Walter Segal. Segal devised a way of simplifying the process of building so that it could be undertaken by anyone, at low cost, and much quicker than conventional building. The building method eliminates the need for 'wet' trades such as bricklaying and plastering, resulting in a lightweight method which can be built with minimal experience and is ecologically sound. 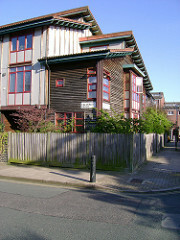 Our tour will look at some examples of this type of building in South East London, going through Lewisham, and then making our way up to Surrey Docks Farm. Meet: 10.30 outside the cafe (north side) in the middle of Brockwell Park. From Ama Asante via Olive Morris and Angela Carter, to Lillian Baylis remarkable, brilliant women have always lived and worked in Lambeth. 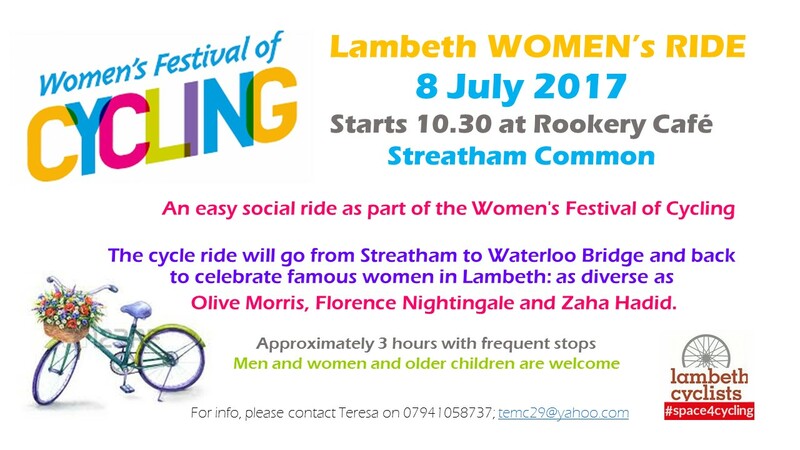 Women from the Lambeth Cyclists will lead a ride for men and women around Lambeth on Saturday 8 July as part of the national Women's Festival of Cycling. We will visit a number of places associated with famous Lambeth women, the Streatham school where supermodel Naomi Campbell studied and the Brixton school designed by world famous architect Zaha Hadid, the site of the South London Women's hospital founded by two of the first women surgeons, and Vauxhall Park which owes its existence to suffragette Millicent Fawcett and campaigner for social housing and open spaces Octavia Hill. At our annual meeting, held on Tuesday 20 June, we elected a new management committee for Lambeth Cyclists. Lambeth Cyclists is the Lambeth borough group of the London Cycling Campaign, registered charity 115789. All are welcome at our monthly meetings. Our regular meeting this month includes our AGM. Come on along tomorrow evening from 7.30pm. Lambeth has the largest LCC membership of any borough in London, with more than 1000 members. We know many of you take time to respond to consultations, ask questions of your councillors and help in many other ways. Thank you! Over the coming year we would really like to boost our activity. 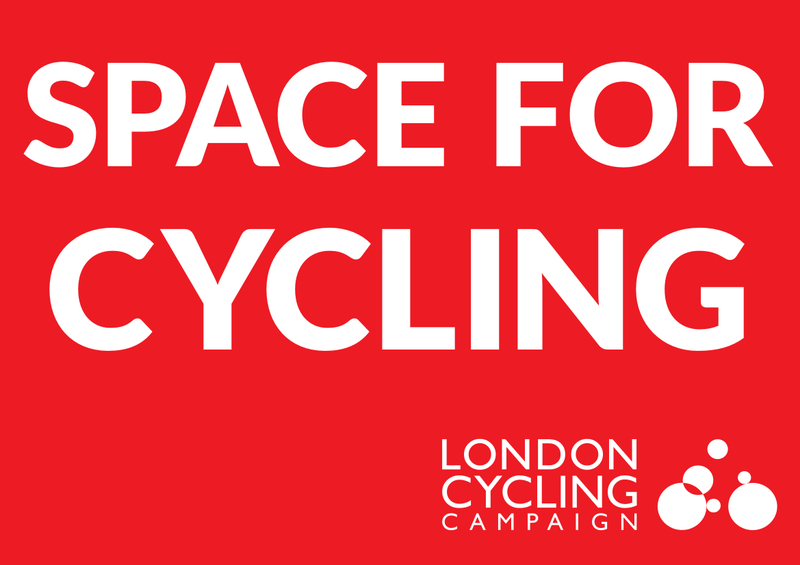 Could you join the Lambeth Cyclists’ committee? You don’t need any experience or qualifications, just an interest in promoting cycling in Lambeth and a few hours you can spare each month. If this might be of interest, come to our AGM tomorrow, Tuesday 20 June, 7.30pm to 9pm at the Stockwell Centre, 1 Studley Road, SW4 6RA. There's bike parking at the venue. Alternatively email Charlie, Lambeth Cyclists' Coordinator. If you don’t want to join the committee, you’d still be very welcome to attend the meeting! URGENT: Lambeth council is asking whether the filter installed to reduce rat-running on Estreham Road (Quietway 5) by Streatham Common station should stay or go. We strongly believe that it should stay, and that it would be beneficial to introduce further filters in the area to make more residential streets access only to drivers. Please respond to the survey now. The survey closes on 19 May. If Lambeth remove this one then it is likely to make the introduction of more healthy streets measures in the borough even harder. Join us on Sunday 26 March for our next architecture themed ride. The "Alphaville" of South London, Croydon is an ambitious, confident and sometimes gritty Edge City to its big sister just 10 miles away. With more than its fair share of negative press since it was reborn in the 1960s and designed unashamedly for the car, nonetheless it has many architectural highlights. We'll ride to see the famous skyscrapers of "mini Manhattan" as well as innovative housing estates, Medieval palaces and Victorian Gothic industrial architecture. Join us on Sunday 26 March, we will meet at 10.30am outside East Croydon rail station. Note the change of date since our newsletter sent to members by post in early March.